Greetings from Marta as tu Mika-Mysliwy, Parhelium Herald! This is the November 2006 Atenveldt Letter of Presentation. 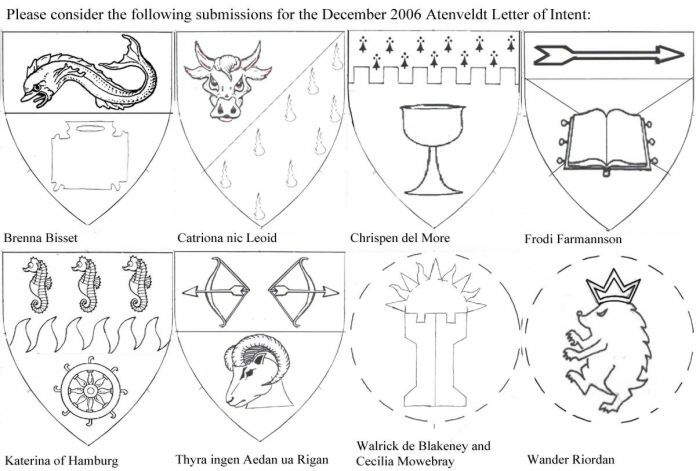 It precedes the external Letter of Intent that will contain the following submissions that are presented here, asking questions of submitters and local heralds who have worked with them; if these questions are not addressed, the submission may be returned by the Atenveldt College of Heralds. I accept online commentary, in addition to questions pertaining to heraldry and consultation for names and armory: brickbat@nexiliscom.com. Please have comments or questions to me concerning this Letter by 15 December 2006. Submission Fees Increase: The cost of new submissions made in the Kingdom of Atenveldt will rise, to $10.00/item, as of 1 January 2007. Local heralds’ offices will receive an additional $1.00/item for new submissions. Heraldry Hut: The next meeting is Friday, 15 December, beginning at 7:30 PM. If you’re interested in attending, please contact me for more information. Recent Actions by the College of Arms: the final actions on those submissions appearing in the 28 April 2006 Atenveldt Letter of Intent appear at the end of this report. Per fess azure and sable, a dolphin naiant and an artist’s palette argent. Brenna is a name found in the Medieval Name Archives’ Problem Names Project ( http://www.medievalscotland.org/problem/names/brianna.shtml ). Of Brenna, it is stated: “Brenna is a hypothetical feminine of Brennus, which is recorded in 3rd and 4th century Roman histories as the name of leaders of a Celtic and a Galatian tribe. We have no idea what the original name might have been before the Roman historian latinized it; it might have been very different. In the context of late Romano-Celtic culture, which was heavily influenced by Latin, the feminine Brenna is plausible even though it is not recorded. The name is in use in modern Italian as Brenno and Brenna; we do not know if it survived through the Middle Ages or if it was revived sometime afterward. There is no basis for considering either form of the name to be consistent with medieval Welsh, Gaelic, or Breton naming.” Bissett (undated) is an English family name, and the form Biset is seen in 1155-8 (Reaney and Wilson, 3rd edition, p 46, s.n. Bissett). While Bisset is undated in Black, in the entry, the family, with a number of spelling variations, is consistently referred to as Bisset (pp. 76-7, s.n. Bisset). If Brenna were considered a period Italian name (note that the MNA article notes that it is a modern Italian name), the combination of Italian and English (or Scots) elements is one step from period practice, but still registerable. The client is most interested in the language/culture of the name, desires a feminine name and is interested in it being authentic for language/culture (none noted). She will not accept major or minor changes to the name. This particular spelling of the popular feminine name Katherine is demonstrated as an unfortunate Englishwoman, Catarine Mortimer, noted to have been killed in 1380 (Black, The Surnames of Scotland, p. 358, s.n. Hill). MacFayden is an undated form of MacFadyen (Black, pp. 491-492, s.n. MacFadyen). The client is interested in a feminine name and authentic for language/culture (none noted). She will not accept major changes. Per bend sinister sable and argent goutty de sang, in dexter chief a bull’s head cabossed argent. It might be best to start with saying the the client is interested an authentic 12th C. Scottish Gaelic name, and that she will not accept major changes to the name. The Irish (and early Scots) Gaelic form of the given name appears to be Caitríona, an early Modern Irish Gaelic name (c1200-c1700), according to “Index of Names in Irish Annals: Caitríona,” Mari Elspeth nic Bryan (http://www.s-gabriel.org/names/mari/AnnalsIndex/Feminine/Caiterina.shtml ). Black gives the Gaelic form of the byname as MacLeòid (p. 538, s.n. MacLeod), but the nic particle is probably incorrect for an early Gaelic name. It is likely more accurate as inghean Leòid. Sable, a chalice or and a chief embattled erminois. The name is English. Crispin is a masculine given name, and the Latinized scribal form Crispinus is found in Curia Rolls 1201 (Withycombe, 3rd edition, p. 76). The client would like the spelling as close to what is submitted as possible (which might be a challenge or a hopeless case, as the “Chris-“ names appear to come from Christ and Christian sources, while Crispin originates from a Latin name meaning “curly”). del More is dated to 1275 as a surname (Reaney and Wilson, 3rd edition, p. 313, s.n. Moor). The client is most interested in the sound of the name. He wishes a masculine name and one authentic for 14th C. England. Per saltire Or and sable, an open book argent and a chief sable charged with an arrow Or. ( http://www.vikinganswerlady.com/ONMensNames.shtml#f ). Her citations show Fróði from Geirr Bassi Haraldsson’s The Old Norse Name (Studia Marklandica I, Olney, MD: Markland Medieval Militia, 1977), and Farmann from Gillian Fellows-Jensen’s Scandinavian Personal Names in Lincolnshire and Yorkshire (Copenhagen, Akademisk Forlag, 1968). The client is interested in the sound of the name, wishes a masculine name, and the name being authentic for 10th C Norse time and culture/language. The name is English. It is the feminine form of Julian, and it appears in England as early as the Curia Rolls 1196-1220 (Withycombe, 3rd edition, p. 184, s.n. Julian(a)); Withycombe does not have an example of the double -nn- spelling, but this seems a reasonable variation. Wilkins is undated in Reaney and Wilson, but Wilekin is dated to 1180 and Wylkyns to 1327 (3rd edition, p. 493, s.n. Wilkin). The client is most interested in the language/culture of the name, desires a feminine name, and is interested in having it authentic for the time period 14th-17th C. She will not accept major changes to the name. Per fess rayonny argent and sable, three natural seahorses azure and a Catherine wheel Or. Talan Gwynek ( http://www.s-gabriel.org/names/talan/reaney/reaney.cgi?Katharine ). Hamburg is a city in northern Germany, an important port town throughout the Middle Ages and a major port of entry from 1550 on ( http://international.hamburg.de/index.do?ok=18338&uk=18365 ). The client is most interested in a feminine name and wishes it authentic for time period (from copies provided from S. Gabriel reports, it seems to be 14th C.). Per fess Or and sable, two bows nocked and drawn, strings to center, and a ram’s head couped counterchanged. ( http://www.s-gabriel.org/names/mari/AnnalsIndex/Masculine/ ). (Her first choice of name was Aodhan, but we were unable to find a period source of it.) Rígán is an early masculine given name in Ó Corráin and Maguire, p. 155 (the client’s legal given name, and she likes having it as some element of her SCA name). It might be that the name is more accurate as Thyra inghean Áedáin inghean Uí Rígán (but don’t quote me!). The client is most interested in the language/culture of the name, wishes a feminine name, and is interested in having it authentic for the language/culture of 10th C Irish. If 10th C. Danish could be considered the equivalent of Old Norse, then a name with Irish Gaelic and Old Norse is one step from period practice, but registerable. (Fieldless) Issuant from a tower per pale argent and sable, a demisun Or. The names were both registered December 2005. (Fieldless) A hedgehog rampant proper crowned with a crown of three points voided argent. The name was registered January 1991. The client is a Viscountess of the West and received her Viscounty 7 May 1995. The voided crown is found on the armory of the West Kingdom. Atenveldt, Barony of: NEW NAME and BADGE for the Order of the Dog’s Gamb: (Fieldless) A woven dog’s collar checky azure and argent, edged gules, pendant therefrom five hawks’ bells Or. Atenveldt, Barony of: NEW NAME and BADGE for the Order of the Roots of the Barony of Atenveldt: Gules, two palm trees eradicated, trunks crossed in saltire, argent rooted Or. Argent, two palm trees couped, trunks crossed in saltire, proper and in chief palm frond fesswise vert. The branch name was registered January 1981. (Fieldless) A lion couchant argent charged upon the shoulder with a decrescent sable. The client’s original badge submission, (Fieldless) A lion couchant argent charged upon the shoulder with a decrescent gules., appears in the October 2006 Atenveldt LoI. However, it was withdrawn because the July 2006 Letter of Acceptance and Return of the College of Arms granted additional protection to the armory associated with the Red Crescent: “Red Crescent. Restricted charge. A single gules decrescent on any argent background or in any way that could be displayed on an argent background (such as a fieldless badge).” As the lion serves as the argent background for the single gules descrescent, this submission conflicted with this decision. The client has changed the tincture of the decrescent, resolving the issue. Helena de Argentoune (Twin Moons): NEW BADGE: (Fieldless) A simurgh volant bendwise Or. Nezhka Radokovaia (Barony of Atenveldt): NEW NAME and DEVICE: Per pale sable and gules, two rams combatant between three mullets Or. Nikolás Sieghard (Twin Moons): NEW NAME and DEVICE: Azure, a pale raguly bretissed argent between a gauntlet and a smith’s hammer Or. Shanda MacNeil (Atenveldt): NEW BADGE: Or, semy of annulets sable. Sha’ul of Yoppa (Burning Sands): NEW NAME and BADGE: Per fess embowed counterembowed sable and argent, in fess two stars of David azure and argent. Thomas Mac Aedain (Barony of Atenveldt): NAME and BADGE RESUBMISSION from Kingdom, October 2005: Argent, four crosses formy two and two and a bordure gules. Gawin Nortmann (Twin Moons): NEW BADGE: Gyronny arrondi azure and Or. Azure, a gemstone argent and a bordure wavy ermine. RETURNED for use of non-period depiction of a charge. Annalena Gianetta dei Medici da Vicinza. Name. Beatrice Fayrwether of York. Name (see RETURNS for device). Cyneburg Thorisdohter. Name and device. Per pale sable and vert, a lightning bolt palewise and a garb, on a chief Or three hearts gules. Originally submitted as Cyneburg Thorisdohter, the name was changed at kingdom to Cyneburga Thorisdohter, presumably to match the documentation provided. "PASE - Prosopography of Anglo Saxon England" (http://www.pase.ac.uk/content/lists/select.html) lists the spellings Cyneburg, Cineburg, and Kyneburg. Therefore, we have changed the name back to the originally submitted form, as it is well attested in Anglo Saxon England. Neither the fact that the change had been made nor the reason for the change were listed on the LoI. Let me stress once again how important it is to include all information about changes made to a name at kingdom. Even if a change seems minor, it must be mentioned on the LoI. This allows the College of Arms to evaluate whether the change is truly necessary and fix them if they are not. Failure to mention changes may cause an item to be pended for further consideration; repeated failure to mention changes may be cause for administrative return of items or entire letters. Eirene Zaridina. Name and device. Per bend sinister argent and azure, a bunch of grapes counterchanged. Faolán of Atenveldt. Holding name and device (see RETURNS for name). Azure, a chevron between two hearts Or and a wolf's head erased argent. Submitted under the name Faolán Boru. Guillaume le Dragon. Name and device. Azure, on a roundel per pale sable and argent, an Oriental dragon tergiant embowed-counterembowed counterchanged. Linnett Marie de Ryes. Device. Per saltire sable and gules, an acorn within a vol Or. Merrick O Dowling. Badge. Sable, a bend cotised between two death's heads argent. Richard Frogenhall. Name (see RETURNS for device). Listed on the LoI as Richard Froggenhall, both the forms and documentation showed Richard Frogenhall. We have changed the name back to the spelling on the forms. Rivka bat Yehudah. Device. Azure, a chevron rompu ermine between two wolves' heads couped respectant and a feather argent. The submitter has permission to conflict with the device of Amazonia Longa, Azure, a chevron rompu ermine between two triquetras argent and a rapier proper. Séamus mac Ríáin. Name and device. Or, a winged cat sejant sable and on a chief gules three open books Or. Submitted as Séamus mac Ríán, the patronymic was in the nominative case rather than the required genitive case. We have changed the name to Séamus mac Ríáin to correct the grammar. Snorri inn hávi. Device. Per bend sable and Or, a wolf passant counterchanged. Beatrice Fayrwether of York. Device. Per chevron azure mullety argent and gules, a chevron Or and in base a cockatoo displayed argent. This is device is returned for redrawing under RfS VIII.3, Armorial Identifiability, as the cockatoo could not be identified as a cockatoo. This is also two steps from period practice: one for using a cockatoo, which is native to Indonesia, Australia, New Guinea and other South Pacific islands (therefore falling under the same strictures as other non-European fauna), and one for its being a bird displayed that's not an eagle. This is also grounds for return. The byname Boru (in Gaelic, Bóroma) is, as far as we can determine, a unique byname. Mari Elspeth nic Bryan, "Index of Names in Irish Annals: Descriptive Bynames: Bóroma" (http://www.s-gabriel.org/names/mari/AnnalsIndex/DescriptiveBynames/Boroma.shtml), notes "This byname seems to be unique to Brían Bóroma, the high king who died at the battle of Clontarf in 1014." We have found no examples of Bóroma or Boru used as a byname in period that did not refer to this king. RfS IV.3 states, "In some cases a unique name, surname, or epithet is so closely related to an individual that its use alone can imply relationship to that individual." This is the case with the name Boru or Bóroma. Barring documentation of this name used as a byname by other individuals, it is not registerable. His armory has been registered under the holding name Faolán of Atenveldt. Richard Frogenhall. Device. Or, a fox's mask sable and a bordure embattled azure. This device is returned for conflict with the badge of Conrad Stronghand, Or, a wolf's head caboshed sable maintaining a rose gules, barbed, seeded, slipped, and leaved proper. There is a CD for adding the bordure but nothing for removing the maintained rose. Vicana de la Haye. Name and device. Argent, a gauntlet inverted aversant sable winged gules grasping a fleur-de-lys fesswise purpure, a bordure flory counter-flory gules. This name is two steps from period practice. First, assuming the inscription from Roman Britain used to document this name was carved in 500 AD (which is just after the Roman period in Britain is typically said to have ended), there is a gap of nearly 800 years between the dates at which the byname is documented and when the given name might have occurred. In fact, it is likely that the inscription is older than this. Second, the mixture of the truly Roman name (albeit found in Britain) with an Anglo-Norman byname is highly unlikely. While Withycombe, The Oxford Dictionary of English Christian Names, notes a trend towards fanciful Latin style names in 13th C England, few of these names are derived from the pool of attested Roman names. This device is returned for lack of identifiability, which violates RfS VIII.3. Either inverting the gauntlet or making it aversant would hinder its identifiability; doing both makes it extremely difficult to identify the charge. Adding the wings and the fleur-de-lys pushes it over the edge and makes the collection as a whole unidentifiable.